Happy Tuesday lovelies! Today, The Makeup Examiner is going to review a few products from Bigen. So without further ado, let’s jump right in. Bigen is a Japanese company, best known for its innovative Permanent Powder Hair Color and Bigen Semi-Permanent Hair Color, both of which do not contain ammonia or hydrogen peroxide. And, both have become cult classics for women in over 70 countries. Recently, Bigen expanded its offerings with the introduction of several hair care products, which incorporate “the hair secrets of Asian women who have long, strong, shiny hair,” with the infusion of sunflower oil, shea butter, beeswax, and rice water essence (Inositol), into its formulas. The Makeup Examiner has naturally curly hair and depending upon her mood (and energy level), she will straighten the often-untamable curls. Beginning with Bigen Protect & Repair Shampoo ($4.99), while the shampoo offers a lovely organic scent, that’s about all that it offers. Bigen Protect & Repair Shampoo didn’t leave my hair feeling clean, protected or moisturized. Bigen Protect & Repair Shampoo actually left my hair feeling stripped. Fortunately, Bigen Protect & Repair Deep Conditioner was amazing. Bigen Protect & Repair Deep Conditioner comes in pillow packs that are the perfect size for a deep conditioning treatment and has the same lovely scent as Bigen Protect & Repair Shampoo. For those that groan over single size pillow packs, be reminded that Fermodyl Roux Professional Hair Treatments come in one-use vials! Bigen Protect & Repair Deep Conditioner left my hair feeling repaired, protected and nourished. At the budget-beauty price of $1.99, Bigen Protect & Repair Deep Conditioner is a major bargain for anyone who needs a solid deep conditioning treatment! 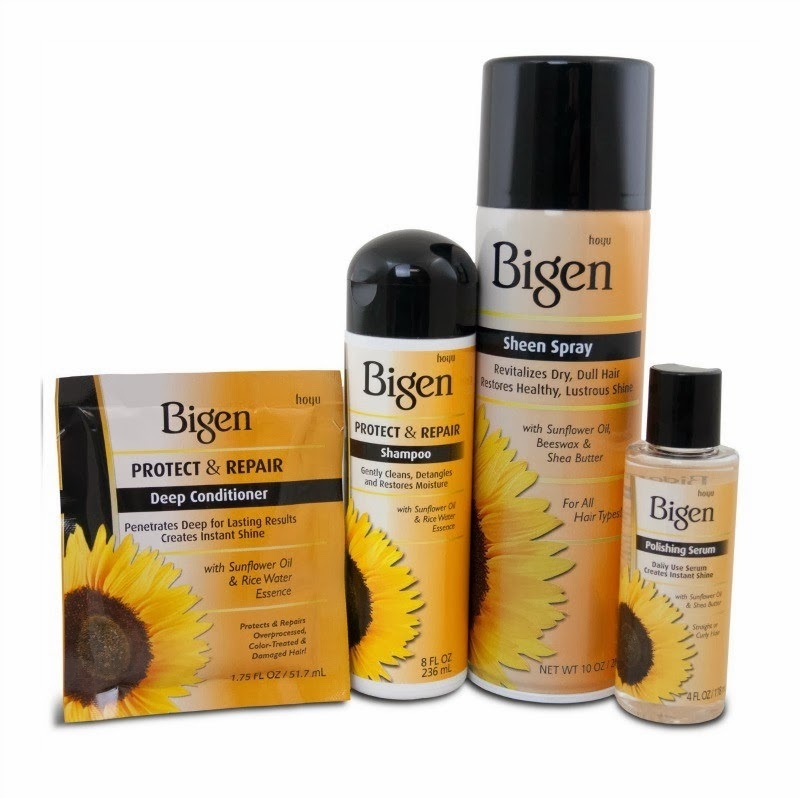 Bigen’s hair care line offers two other products, Bigen Sheen Spray and Bigen Polishing Serum. The Makeup Examiner wishes that she was sent the sheen spray, but alas she wasn’t and will round out this review with Bigen Polishing Serum. To test out the polishing serum, TME whipped out the blow dryer and flat iron. Yep, it was time to straighten her hair! Actually, TME tried the polishing serum to tame a few flyaways on her curly hair and was thrilled with the results of a few drops of serum. When TME straightens her hair, it can become a major fail sans the correct products. Happily, Bigen Polishing Serum was AHA-mazing! The Makeup Examiner used the polishing serum as a protectent prior to straightening her hair and was pleasantly suspired that the serum left her hair smooth, shiny and well … protected. As always, The Makeup Examiner hopes that you’ve found this review to be helpful. You can find Bigen Hair Care Products online and at SallyBeauty Supply nationwide.